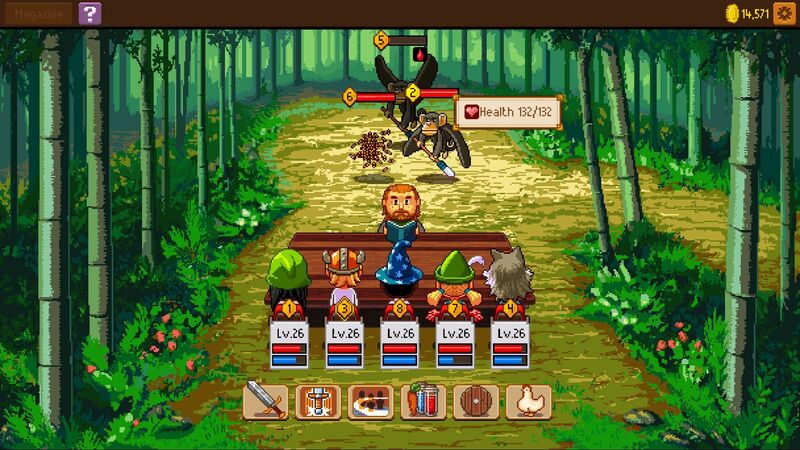 Knights of Pen & Paper 2 is a cute-looking 16-bit RPG, but it has deadly combat mechanics. Most of the battles will absolutely crush your heroes unless you know what is going on. To be successful against enemies, you need to know about the basics of combat, the conditions mechanic, and special abilities of your heroes. Luckily, we have prepared a guide about all of these: Keep reading, weary adventurer, if you want to be successful on the battlefield. 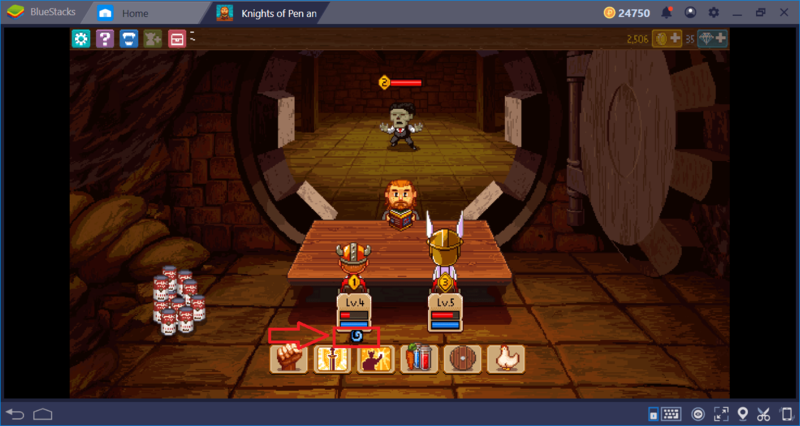 Whether you are aware of it or not, every action (attack, travel, defense) is tied to a dice roll in Knights of Pen & Paper 2. This is literally a dice, and you may see it rolling on the screen. Simply put, when you attack, for example, the dice get rolled and the result of your attack is determined by the outcome. (This system works exactly like this for other actions too.) If the dice are in your favor, your attack lands, if not, you miss. And if it is really in your favor, you land a critical hit and maybe apply a condition on the enemy. The dice are in our favor, so we can complete this journey without an ambush. You cannot predict the outcome or control the dice in some way, the only thing you can do is to accept its results. 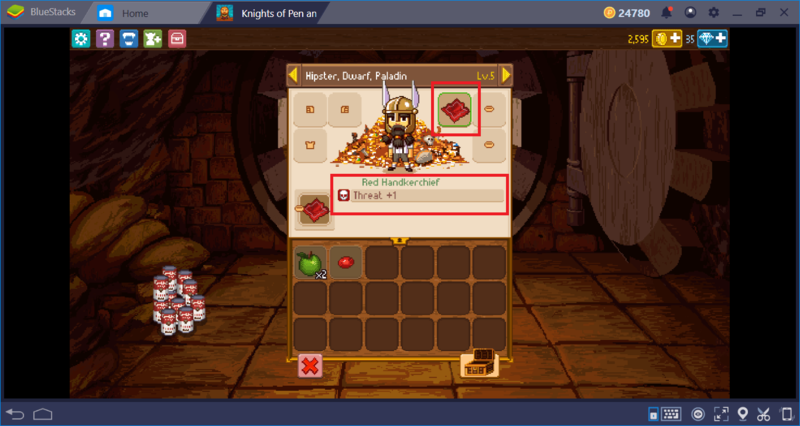 Knights of Pen & Paper 2 uses an icosahedron dice (as far as we can see) and the results are random. Conditions are temporary negative status effects on characters. Or, in other words, they are “debuffs”. You can give a condition to enemies or take one from them – again, it is based on the outcome of the roll. Likewise, getting rid of these conditions is also tied to dice rolls. For easy reference, here are all the conditions in Knights of Pen & Paper 2 and which kind of roll you need to make to get rid of them. If you have a condition, the game makes these rolls automatically and you just see the results. If you are lucky enough, you get rid of the conditions – if not, they continue to be effective. Having a healer in the party is important for this reason: Most of these conditions can be healed through until you get a successful roll. Example of a Stun condition, you can tell which condition you got by looking at the icon below the health bars of your characters. 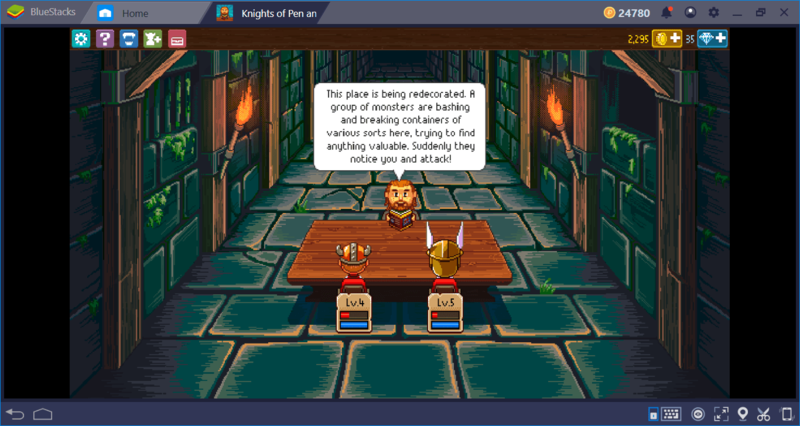 As we mentioned in our review , the battle system of Knights of Pen & Paper 2 is turn-based. 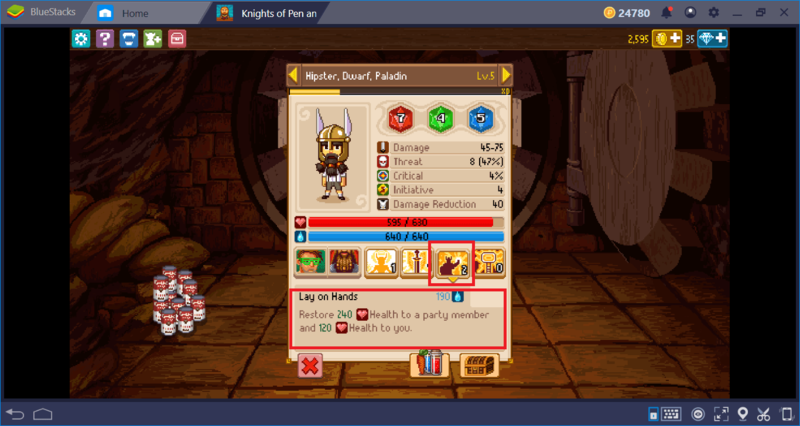 Numbers next to health bars represent the attack order, so if you see “1”, for example, this means that character will attack next. But, who makes the first attack? More importantly, to which of your heroes enemies attack first? The answer to both of these questions is “stats”, which also determines what kind of classes you need to pick for your party. Let’s explain with screenshots. “Initiative” determines which side will attack first. So, if one of your heroes has a higher initiative than the enemies, you will make the first attack. Initiative is tied to dexterity (green crystal) and the base dexterity values of hunters/thieves are always higher, so you must always add one of these classes to your party. “Threat” determines the hero that will get the most beating from enemies. In other words, your rivals will attack the character with the highest threat first and foremost. Threat is tied to strength (red crystal), and warriors have the highest base strength values, so you must always add a warrior to your party, to serve as a tank. Note that you can further increase all stats (including threat and initiative) with the help of equipment. So while distributing the items, makes sure every hero gets the best item for its class. We explained why we need a warrior and a thief in our party, but there is one more class we are in desperate need of: healers. These can be clerics or paladins, both classes have access to healing abilities. However, paladins will be the better choice,S especially at the beginning of the game, due to their higher armor and health values. Completing quests will award XP points and you will use these to increase the effectiveness of special abilities of your heroes. While doing that, make sure to increase the natural special ability of that hero – for example, paladins have abilities that can increase their threat and healing. If you are using a warrior for the threat, you should only increase the healing abilities. Make sure to create the “holy trinity” while forming your party: Get the heroes that have a bonus to initiative, threat, and intelligence (healing). Our recommendation will be a warrior-paladin-thief combo, but you can freely choose of course. Improve these stats with the correctly distributed items. İncrease only the abilities that match with these rolls and instead of distributing your points on many, pick one ability and stick with it. And of course, hope for getting the best dice rolls. Now, you are as ready as you can be: Clear those dungeons, finish those quests, and show those monsters who is the boss. 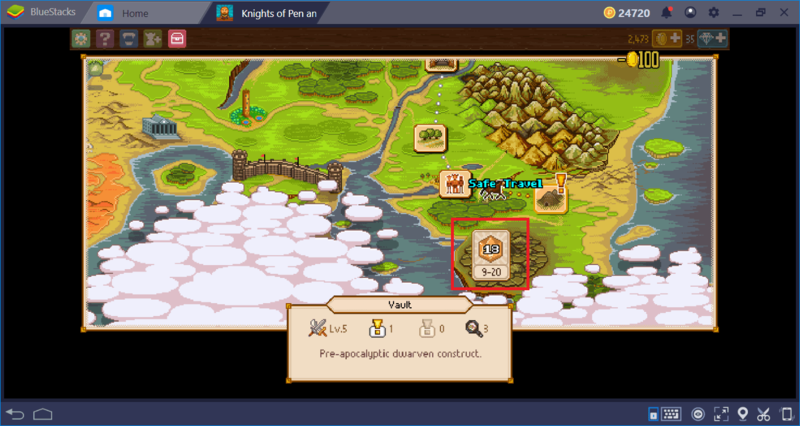 Make sure to read our other Knights of Pen & Paper 2 guides too, they will help you further. And if you loved clearing dungeons, don’t forget that there are other RPG games too, which you can play on BlueStacks. Good luck and godspeed!